SIZE: 12 7/16" X 16 11/16"
Bonne, a trained mathematician, was appointed Hydrographer to the King. He took over the responsibility of the french hydrographic institute ("Dépôt de la Marine") after the death of Bellin in 1772. This position enabled Bonne to the unequaled access to prime mapping data, which he could use successfully for his own private business interests. He followed in the steps of the french school of cartographic minutiae and geographic accuracy. As such he produced, often in collaboration with other mapmakers, a large number of excellent sea charts. His name is generally associated with a type of equal area projection he often used after 1757. Of note, his 1776 "Atlas Moderne". But he is most well known for the wealth of maps he prepared for Guillaume Thomas François Raynal's "Atlas de toutes les parties connues du globe terrestre" (1780), and also for Nicolas Desmaret*'s "Atlas Encyclopédique" (1787, re-issued in 1827). Desmaret: of engineering fame for the first recorded design of a tunnel between France and England in 1751. Bonne migth have produced this large map (12 7/16" X 16 11/16") for his 1767 "Atlas Maritime". 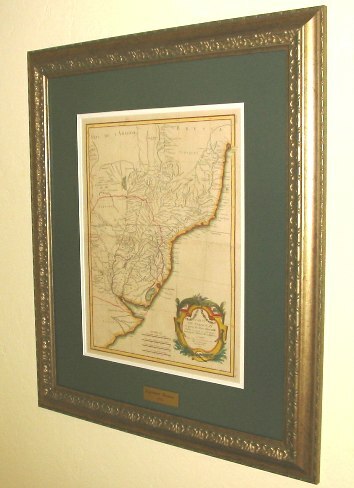 It describe one of the spanish colonial administrative area: the "vice kingdom" of Paraguay. Of little interest to the spaniards, Paraguay was pretty much left to fend for itself. In 1617, its settlers elected to split the area in two: Paraguay proper with Asuncion as capital, and Rio de la Plata with Buenos Ayres as main town. Notice the well documented layout of the river system, and the push of Brazil towards the mouth of the river Plate. Also notice between the Parana and the Brazil border, the mission river, and the mission names. Same along the rivers north of Santa Fe. 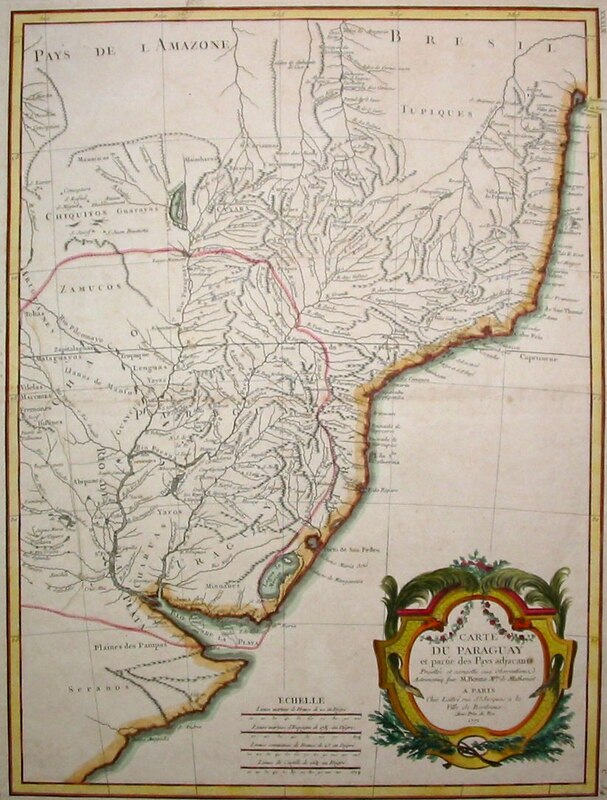 To protect and convert the Guarani indians, the Jesuits, due to the power vacuum left by the weak Asuncion government, evolved a complex system of thirty quasi independent "republics" which thrived between 1650 and 1767 (year when the Jesuits were expulsed from the area). Notice in the cartouche, Bonne in 1771 is only a "math teacher'. A year later he will become the head of the french "depot de la marine", the leading cartographic institution of the time.